While a number of monitoring initiatives have been undertaken within the Waikato Coastal Marine Area (CMA), there has been no consistent approach to what, where and how monitoring is undertaken. This makes the monitoring of progress towards achievement of objectives challenging. There is therefore a need for a framework which accommodates strategic prioritisation of monitoring effort, along with the formulation of monitoring programmes. Such a framework would ensure that the range of current and desired states, together with existing and future pressures for the CMA are encapsulated. 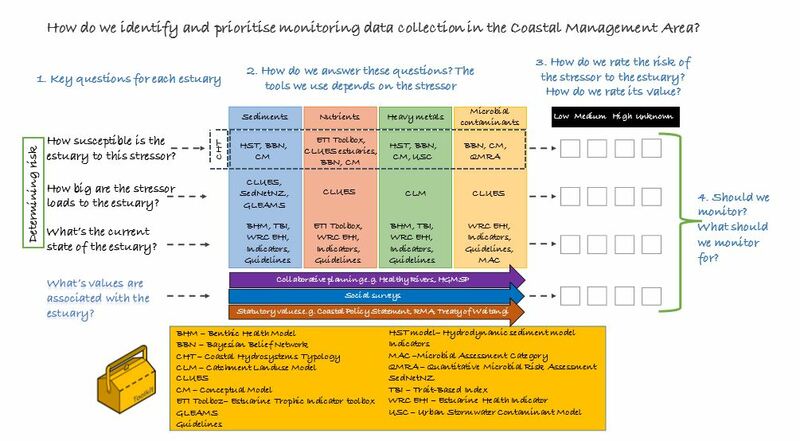 We propose a flexible framework for identifying and prioritizing collection of monitoring data within the CMA, based on an understanding of key drivers in the catchment. It integrates a range of interrogation and decision support tools and is able to accommodate variations in data quantity/quality.